The boat was further than it sounded. When sound travels across the water it is amplified; as the water cools the air near the surface it slows the sound waves down, bending them allowing more of the sound to reach you. He knew this; he listened intently, trying to discern if it was getting louder or quieter, closer or further. He had been listening like this before, listening for a boat motor. It had been mid-morning in early August or Fogust as it was known locally. 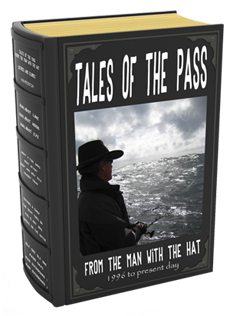 He had led the fleet out to Money at first light for a quick Halibut trip, twelve boats limited-out in a couple of hours, but a wall of fog had greeted them about half way back. It enveloped them in a seductive way, first it is faint and you see through it and keep going, it becomes more dense ahead but you look straight up and it is blue sky so you keep going, then it envelopes you and you have no bearings, none. And the instinct you have is wrong, the more right you feel about it the more off course you are. Having been in the fog many times he had a high regard for its blinding effect. Quickly he had regrouped the boats, 3 rows of 4 behind him, one port, one astern, and one starboard. Radio checks with each boat, order established and visual contact with a minimum of 2 boats required. Progress was slow, painfully slow. It was hard to keep the boats on step without risking someone falling out of line, going astray. And running blind with all the flotsam and jetsam posed another level of risk. The row astern had the crew boat bringing up the rear, keeping tabs as is the custom. Within minutes of getting under way, the call came on the radio from the crew boat at the rear astern. One boat at the end of the starboard row had veered off and was heading off at speed, direction unknown. All boats instructed to stop, close in together, minimum 3 boats in visual contact now prescribed. All motors off, stay within hailing distance of 2 boats, the group would drift together and would be a larger target. He radioed the boat gone astray, they thought it was the other way, they knew, they said. But now they were not so sure. Can you come and get us? they ask. The Man with the Hat was furious, but he knew anger blinded good judgement. He stopped for a moment, collected himself, he had seen this before. Trying to get a group of guys to follow directions was contrary to every rule of their testosterone-fueled wisdom; logic and caution discarded, they often found themselves in trouble. So now they will need to be found, now they want to listen. Time to focus, the anger dissipated. With all the motors in the group turned off he listened intently for theirs. He could hear it but not be sure of the direction and when he started in pursuit, his motor cancelled out theirs. Time to change tack, Adapt. He had them stop their boat, implemented radio silence except for them and instructed them to listen for his motor. He would drive around the rafted-up fleet in larger and larger circles stopping at each completion to check in with the wayward boat. As the circles expanded more feedback came in, he was lucky this time, on the 3rd time around he could tell which side of the group they were on, one more circle, a bit wider this time and he could make out their ghostly figure. Returning to the group with the boat following close behind, and then resetting the order of the groups so this boat was right on his stern, they got back under way. 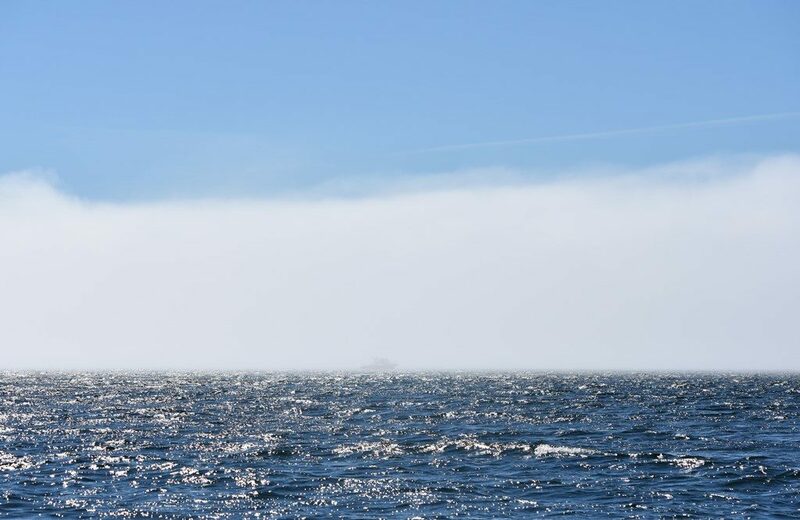 After 20 minutes they emerged from the wall of fog, one by one, as if a curtain had been lifted at once for each of them; turning to look back it was almost as if the world had been painted white from the sky to the water at just that line. The sun was bright now, the lodge in sight. He remembered the relief he felt when he had found that boat. He wished he could circle the one looking for him now, discerning its direction, distance. But with only the distant sound of one boat all he could do was listen, concentrate on the task at hand, conserve energy, the cold was taking its share and he needed it all. He could hear it again now, more clearly, it sounded familiar, and he could tell it was the guide boat, he knew that motor, and they were out there, looking.